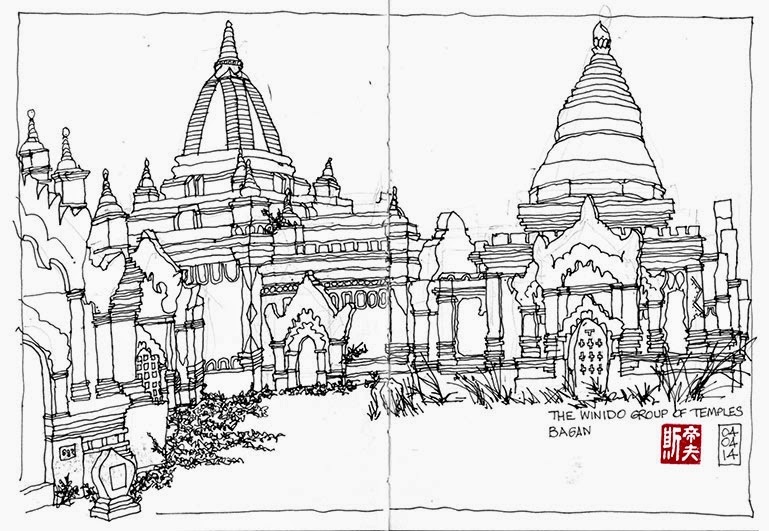 Mrs M went for a pummelling in the spa while I wandered out of the hotel grounds to sketch a cluster of temples known as the Winido group. As I made myself comfortable in the shade of an adjacent temple, a local chap appeared from a ramshackle hut where his family were living while working on the archaeological monuments. He stayed with me for almost the entire time while I scratched and scribbled. I turned round after a while to find another family looking over my shoulder from inside the building, at which point another person showed me his roll of paintings, which he just happened to have under his arm. I politely declined and returned to Mrs M who was soothed after her Myanmar massage. The late checkout allowed us to leave for the airport at 3pm where we sat for almost four hours in barely air-conditioned departure lounges waiting for the plane which was delayed due to bad weather in Heho. A rusty bus took us to the plane when it arrived in total darkness and we found a couple of vacant seats among the musty passengers that had flown on the circuitous route from Heho and Mandalay. An hour-and-a-half later, we arrived in Yangon, found a taxi and headed for the hotel where, after six hours of travelling, we took much-needed showers. The evening was a bit of a blur. After a beer or two in the bar, I spent the rest of the evening in someone’s house where I met a couple of domesticated geese.